GPS acquired quickly and works accurately and flawlessly. Heart rate acquired slowly (and continues 'reading' a HR for 30s after taking off), lags effort, and sometimes is completely random (this morning, during a short climb, showed 60 bpm, while during an easy flat stretch indicated 118 bpm, which latter is about 75 % of my max HR) . Compared this unit (simultaneously during a ride) with another Garmin unit using a chest strap, and the wrist HR had a large error, exceeding 20 bpm or so, 10 % of the time. Unfortunately, the inaccuracies were greatest during a hard effort, when I'd most want accurate data. Watch died in 20 of water after 1 year and 1 month. I had doubts about its durability for most of that year, but it's still a disappointment that the device didn't last longer. I've had my VivoActive HR for about 4 months now and I could not be more pleased! I've been riding with Garmin GPS devices for years and currently use a Garmin 510 on my bike. They are very, very close to each other on everything, I use both because occasionally my G-510 goes crazy and loses its location in the middle of a ride. I've been able to compare my Vivo with friends using other similar products and nothing compares. If you want to Strava all the outdoor activity, get this. Small size, good battery life, all day Heart rate for monitor RHR. A random tip, once the touch screen freezed. Might be due to static in the winter, I'm giving up and almost return it. But it unfreezed in the shower, works fine afterwards. This HR watch works exactly as advertised and with it's two buttons and touchscreen it is simple to use. I use this HR watch for running and biking. I like it's ease of use and the fact that the charge lasts several days. I would like to see a trail running function on the watch. I've owned this Garmin for close to two weeks now and I do like it for the many activities it can track and the really good software it comes with. It also works well on stationary bike and treadmill. Linking to Strava is a breeze and all activities are tracked very well. The heart rate monitor works well for all running but not so much for cycling. On all even and uphill routes it is giving you good data, but as soon as you descend it produces garbage due to your muscle flex - values are far too high and your suffer scores are completely wrong. If you want full heart rate data, you'll need to link a strap to the watch. First let me say, I love Garmin products, so when I saw this was finally released I was so excited to get mine! Unfortunately for me the excitement was short lived. Straight out of the box I didn't like it, but in fairness I did want to at least give it a try. For a petite female, 6 wrist, I felt like I was running around with a big block on my wrist. I could have possibly wrapped my head around wearing it if the band wasn't 10 long and 1 wide and not so manly. A little more feminine option would have been great. With that said, it functions very well for what it was made to do and has soooo many activity options! I pretty much run and hike, so to have all the extra was a bit of overkill, but for someone who does many different activities, it would probably be quite useful. I was really looking for an option that would track my day to day activities, with a GPS and a heart rate monitor, this definitely fit in that arena, for me it simply was the look of the device that turned me off. BikeTiresDirect.com was phenomenal in their shipping and if they sell the next product I'm now waiting on to be released I would definitely buy from them again. Not to mention they have a great return policy! I upgraded to this watch from my VivoSmart watch. So glad I did. I love having the GPS and the built in HR monitor is AWESOME. The watch is not as big as I thought (which is a huge plus to me). I am able to wear it all day for work and play. The multisport tracking is great. I hike, walk, bike, and swim. But there are many more to choose from. Shipping was super fast (same day) and delivered quickly and as promised. Would definitely suggest this watch and biketiresdirect.com to friends. Thanks! I am training for my first triathlon and new to the active watch world. This watch keeps my swimming, cycling, and running all in one place. It has also been paired with my speed and cadence sensors when cycling. Dennis provided excellent customer service as the item was shipped same day and received the next day..nothing beats free 1 day shipping. Thank you guys! Good device with many apps, maybe too many. I use my watch to count steps,walk, play golf, and set goals. It is easy to use and can be use for many different activities. It is great for setting goals and motivating one to meet the goals set. In other words it is very versatile. The screen is cracked on mine. It would be nice to be able to repair the screen or replace it at a reduced price(It would cost $120 to replace.) It would also be nice to have more than one golf course on the watch at a time. An improvement would be to have the golf stats that are available with the approach series. I use it to track sleep, steps and cycling - but in a relative sense. I am not looking for exact heart rate, sleep hours or steps - because on each of these you have to take the numbers given with a grain of salt. You move your arm too much and it seems to show up as steps, you wake up but don't get moving - seems to count as sleep, cycling... speed, time, distance and elevation seem fine - but if you take a walk from your bike into a market or out on a trail without pausing or stopping the Garmin- seems like it shows up as cycling very slowly. And as noted, I have a Windows phone and as the forums report - windows doesn't seem to agree all the time with Garmin Connect. Sometimes it just won't connect to update - other times the app just loses any memory of my device and I have to re-pair. A relative has this with an android phone and does not have any of my issues - so for non-windows phone folk... it's great. Great watch and innards, but the case is soft. I like that it's a great way to apply some metrics to my day-to-day activity, and I like some of the actual watch features as well. So far I'm only disappointed with the material that encases the electronics. It has dented, scratched and chipped. So it's not impervious to minor scuffs resulting from construction-site activities, which may or may not be a part of your normal routine. Luckily the glass has remained in perfect condition. This watch is well thought out. The only negative for me is the display is somewhat dim. I know it is meant to be used outside but I wear it most of the time. When the backlight comes one, it has a washed out appearance. The functions of the watch are good. They provide good insight into your activities when combined with Garmin Connect. However, not all of the features work well - not sure if it is the watch or the connected phone. LiveTrack works occasionally. When it does work, it only works for about 10 minutes even though the Bluetooth is showing it is connected to the phone. 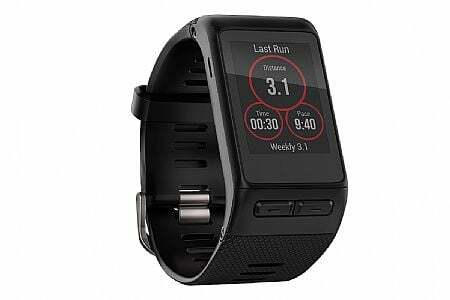 Garmin support told me that is a known issue with their latest firmware and Windows Mobile OS changes that were released concurrently and that there were mismatches. Both Garmin and Microsoft are aware and are working on updates. This is an awesome watch. The apps on this watch are very easy to use. I would highly recommend the vivoactive hr to anyone. I have a Garmin Edge for cycling specific but still use this for all activities including cycling. Very easy to use. Seamless interface with Garmin connect and Strava. Drawbacks - heart rate monitor is fine for steady efforts but not good for intervals. The screen could be a little lighter with the backlight but it would probably shorten battery life which is great at about 1 week. Great on bike rides and keeping all activity on a daily basis. Only down side is the watch face could be brighter when using the back light. This is a fun watch that you can get your important data from very easily. It is also easy to set up and use. The battery lasts about a week before needing recharging.